Did you know that more people around the world now have access to mobile phones than to health care providers? This app seeks to take advantage of the increasing reach of mobile phones to bring pre-natal health information to women and provide easy access to maternal health data using World Bank indicators, thus contributing to MDG 5 (maternal health). Why focus on maternal health? Maternal health care has been recognized as so crucial to the survival and good health of infants and mothers that it has been included as one of the 8 Millenium Development Goals (MDG). Using World Bank Indicators, the Bebemama app draws attention to the importance of maternal health (MDG 5) by showing that the overwhelming majority of infant and maternal deaths still occur in the developing regions of the world. Many of these deaths are preventable with basic pre-natal care. Why a health application for mobile phones? Today, 57% of people in developing countries have a mobile phone subscription, more than the people with access to proper health care, either because no doctor is available or because they cannot afford the fees. At the same time that the overall number of users is increasing, mobiles phones are becoming cheaper and smarter every day, with some smart phones are now available for under US$100. As this trend continues, millions of people, including many poor people, are gaining access to phones which they can use to access a wide range of information. The Bebemama contents can be read on phones equipped with a web browser, Android and iPhone versions are currently supported, and more versions are under development. In addition, Bebemama’s goal is to provide the maternal health information in several languages. At present, the information is available in English and Hindi. The French and Spanish versions are in progress. 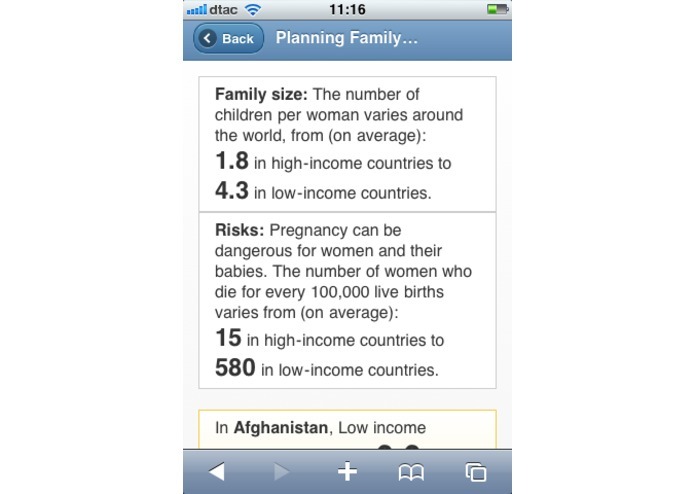 About the Bebemama App The content of the Bebemama app is based on open source public health information provided by the U.S. Department of Health and Human Services (womenshealth.gov). Data is obtained from The World Bank, World dataBank, Millenium Development Indicators (MDGs). 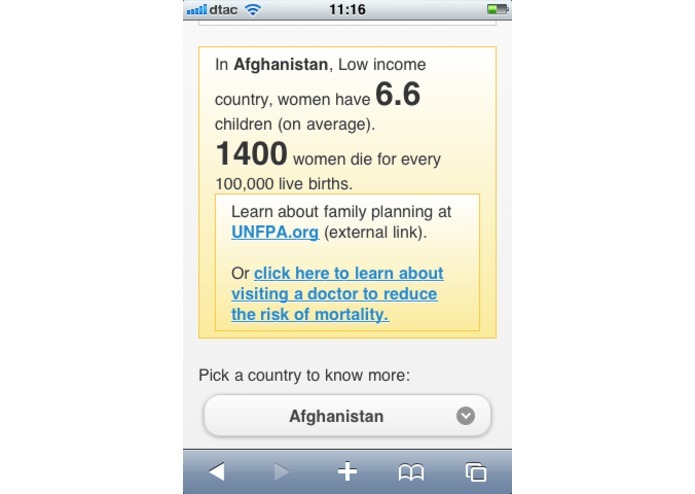 Fertility rate, total (births per woman); Maternal mortality ratio (modeled estimate, per 100,000 live births); Contraceptive prevalence (% of women ages 15-49); Mortality rate, under-5 (per 1,000). Year 2008 values. data.worldbank.org, last update: 1-December-2010 The Bebemama App is available for free download. The code is open source. Bebemama.org is not for profit and relies on contributions from volunteers.